Chili’s Coupons – FREE Dessert, Appetizer, Kids Meal, and To Go Chips!! There are FOUR new coupons that have become available today for the Chili’s Holideals offers! You can get a free dessert, appetizer, kids meal, or to-go chips when you buy one entree now through this Thursday the 19th! UPDATE: Head over to the Restaurant Coupons page to see the latest Chili’s Coupons as this coupon is no longer available. They’re offering new deals every day through Christmas Eve, so if Chili’s made the list of places to eat this week make sure to bring along the current coupons. 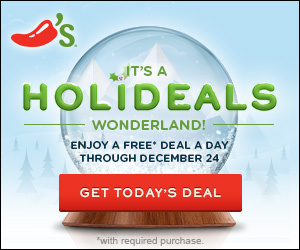 Click to see all of today’s Chili’s Holideals! Be sure to visit the Restaurant Coupons Database for even more great Restaurant Coupons & Deals! « Printable Coupon Round-Up: Kraft, Bumble Bee, Old Orchard & More! Just a heads up you can only use one coupon per table. and chips and salsa doesnt count as meal….had that pulled on me last week! Lisa – Great question! It means that if there are 4 adults at the table, then you can use the coupon 4 times so that 8 kids can eat for free. The kids eat free coupons are the only ones they do this with. What does “multiple redemptions per table are allowed” mean? I understand Not valid w/any other discounts or special offers.. Apparently gone already….link doesn´t work. Sorry about that Gloria! Actually I think the website is down due to too much traffic. As soon as it is up and running again I will leave another comment here letting you know. The site is up again so you should be able to request yours now! sad part u have to print coupon..
We had the Calif Grilled Chicken one & it was VERY good. I had the chipotle & it was good – a little spicy. Enough for two people easily. Canon Powershot 16 MP Digital Camera with HD Video Recording 47% Off + FREE Shipping Today Only!